Pigeons, balloons, arctic foxes, rockets, kites, tin cilinders under prominent cairns, graffitis in rocks, bottles and also golden buttons. All these were the means used by arctic expeditions for communication during those days when satellite phones simply didn´t exist. Many different systems, as you can see, but not all of them actually useful. Analysing and comparing their effectiveness would require a specific article, and who knows, maybe there already exists one. The more extensive description of many of them I have found, was written by Sherard Osborn in the book "Stray leaves from an arctic journal". Sherard, in a very personal witty and funny style, describes them giving you an accurate idea of what was the expectation of success they inspired at the time and how they actually worked. Maybe the more ingenious one, and also the more spectacular, was the inflatable balloon. These amazing inanimate messengers were made of oiled silk and were inflated with hydrogen, which was produced in site mixing zinc with sulfuric acid. Horatio Austin searching convoy of 1850, was one of the first expeditions which used these "new" inventions. At least, that is what Sherard mentions in his account of the voyage. Some of these devices were equipped with a five feet long slow match to which were attached coloured pieces of paper, or cloth, where the position of the rescuer ships was indicated. The messages were supposed to be released by the effect of that match at certain intervals . The papers, would fall from the air with the purpose of indicating any possible survivor where to walk in search of help. Sherard Osborn, complains somehow in despair while describing how almost all the released balloons from HMS Assistance flew in south or south east directions instead northwards. It was generally understood for the Admiralty at that time, and for all the contemporary searchers, that Franklin & Co. were stranded north or northwest from their current position. They thought Franklin was beset some place north of Cornwallis island or in a non existent, open polar sea even further north. 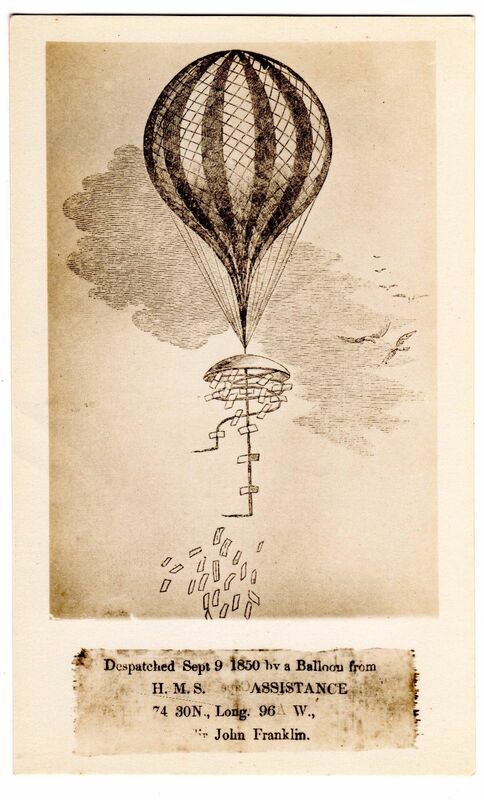 If he, as Richard King firmly believed, had known that the Erebus and Terror were actually located in the vicinity of King William Island, 600 miles southwest of their position, perhaps he would have followed with his sight how his precious balloons flew in a more correct direction than he thought with a much better mood. It is at this point where the real protagonist of this post appear for first time. Our friend Benjamin Balloon, who was scared to death moments before being freed by a couple of s.ailors in the upper deck of HMS Assistance, as the picture in the Illustrated Arctic news shows below. - Oh Release me! Oh release me!.- shouted Benjamin Balloon. 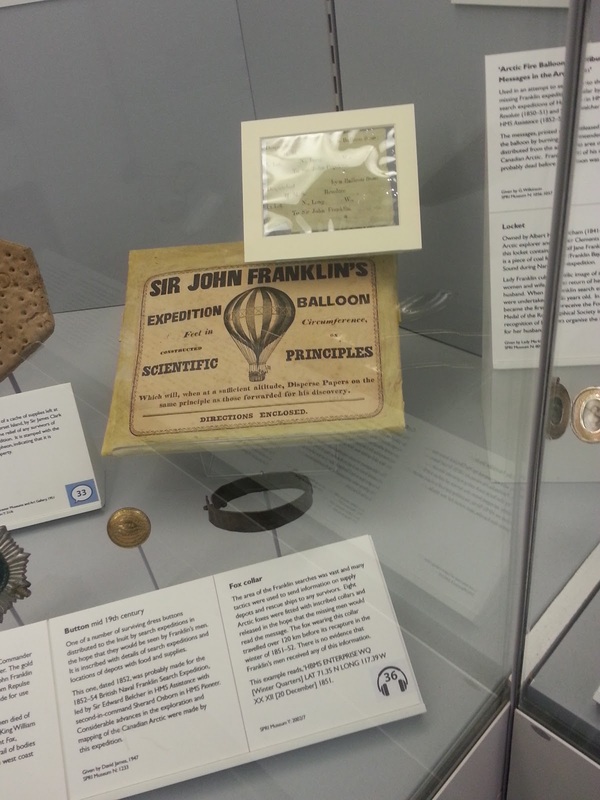 "On monday last, Benjamin Balloon, literally inflated himself from a cask containing Hydro-Gin he became light headed in consequence, and falling into a current of air, soon disappeared from the sight of the astonished spectators. He is supposed to have on his papers to a great amount. Active steps will be taken for their recovery, they being for the most part drafts at sight of the firm of Messrs Cask and easel, of Cape Hotham and leopold." Our indulgent Benjamin, obviously lost almost inmediately his way, taken with him forever those drafts in the wrong direction. You can read the original publication here, (page 28 of the document). Many of those passenger-messages luckily survived that era of creativity and can still be found in some museums and in the mists of the Internet here and there. "Erebus, 112 W, Long, 71 deg. N. Lat. September, 3, 1851. Blocked in"
The Admiralty shouldn´t lose a second and inmediately send a fleet to that place, but...it happens that, as Russell Potter correctly indicated in his post about the topic, that Franklin was never supplied with those wonderful objects, so, apart of many other aspects which play against the veracity of the theory that defends that a balloon could have reached England after flying more than three thousand kilometers, there is the undisputed fact that there weren´t balloons on board the Erebus nor the Terror. That converts the suggestive finding into a complete and cruel hoax. An amazing distance to be covered by an object which proved record of longest distance covered at the time and at those latitudes, was not more than 50 miles. That wasn´t the case of the carrier pigeons, which had been used for very long time as very effective messengers, though not in the arctic. A couple of pigeons were sent by John Ross from Cornwallis island during 1850. Instead of freezing, died of hunger or being shot, they reached his house in Scotland five days after being freed. That was a record never to be beaten for any other kind of messenger used in the polar regions. Ross message, however, was not addressed to reach Franklin, but had a less trascendental purpose, it borne instructions regarding finantial personal matters. Sometimes, both systems, balloons and pigeons were put together in order to optimize the benefits procured for them. A pigeon embarked one of these balloons to be carried for it, at some distance from the ship, before being released during the flight. Ultimately, Salomon Andree also combined these two methods, though this time it was he and his friends the ones to embark in a huge balloon. In his way to the north pole, he sent some pigeons to carry his messages homeward, thing which their feathered companions performed perfectly well for some time. At least, before Andree and company disappeared for the following thirty years before being found death in a lost and icy island. Another formidable method, nor for its effectiveness, but for the merriness it provoked during the short winter days of those arctic expeditions, were the arctic foxes. 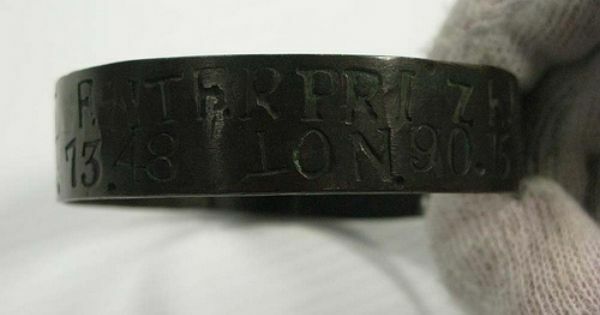 Those little and astute animals were fitted with copper collars on which were engraved the position of the searching ships. animals thus entrusted with despatches or records were liberated by different ships;but, as the truth must be told, I fear in many cases the next night saw the poor " postman," s Jack facetiously termed him, in another trap, out of which he would be taken, killed, the skin taken off, and packed away, to ornament, at some future day, the neck of some  fair Dulcinea. The departure of a postman was a scene of no small merriment : all hands, from the captain to the cook, were out to chase the fox, \vho, half frightened out of its wits, seemed to doubt which way to run ; whilst loud shouts and roars of laughter, breaking the cold, frosty air, were heard from ship to ship, as the fox-hunters swelled in numbers from all sides, and those that could not run mounted some neighbouring hummock of ice, and gave a view halloo, which said far more for robust health than for tuneful melody. Another easy way, but maybe not very effective, method of communication was carving messages in conspicuous stones which usually called the attention of any visitor. Not used normally to deliver messages to other expeditionaries, but more often used as markers of the new conquered territories. That is the case for example of Parry´s stone of Winter Harbour. A stone which would play a very important role many years after, as we soon will see. Rockets and kites of different colours and numbers, were also used to send messages. But were not intended to communicate with lost explorers but with neighbour ships. Kites were supplied to HMS Assistance by Mr Benjamin Smith, that´s what Sherard Osborne says. Was this Benjamin the British politician? Was he an ardient lover of technological and flying devices? Was after him, in his honour, that our beloved Benjamin balloon was named? Surely it was. I have tried to dig a little about his life and bizarre interests but could find at the time I wrote this post. 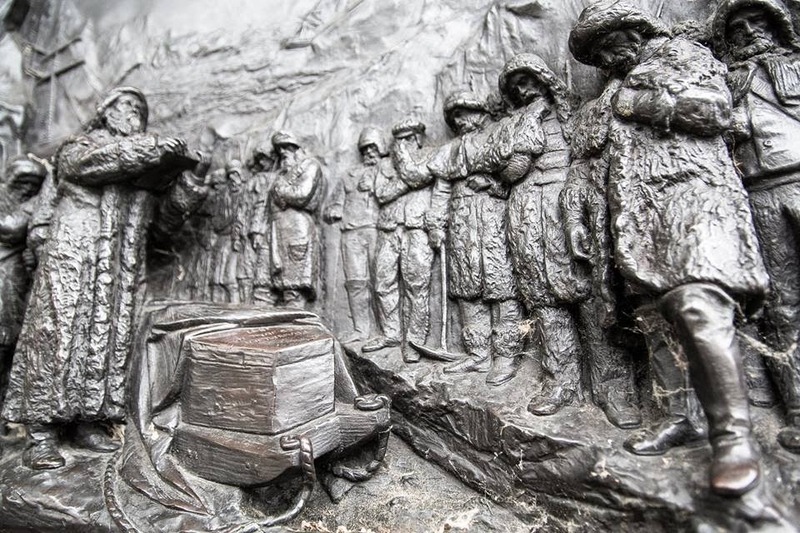 But the more effective way to deliver a message, even if years had passed since it had been written, buried and ultimately found, were the sealed tin cilinders inside of which, rolled papers were placed. Those time capsules, were buried under huge cairns of more than six feet tall located in strategical geographical points. It weren´t few times these tins were succesful in transmitting the intended messages. Narratives of the time speaks of them being opened and sealed again a good number of times. Sometimes, they played crucial roles. Thanks to these methods, HMS Investigator crew was rescued when one of the Kellet rescue parties found the message left by McLure at the feet of the above mentioned Parry´s stone. And it was also thanks for those magical metal cilinders, the Victory point record, that we know the few things are now known about the proceedings of the Franklin expedition before disappearing forever. We don´t know yet if any of these messages, which were hundreds, finally reached the Franklin expedition, maybe one of them deliberado by our Benjamín balloon.... Finding any of these messages, whatever was the method followed to send them, among the belongings left by the crews of the Erebus and Terror in King WIlliam Island, would have helped to know till what year they could have survived. Perhaps, the current searching of the shipwrecks could help us to know if any of these messages finally reached their destination. 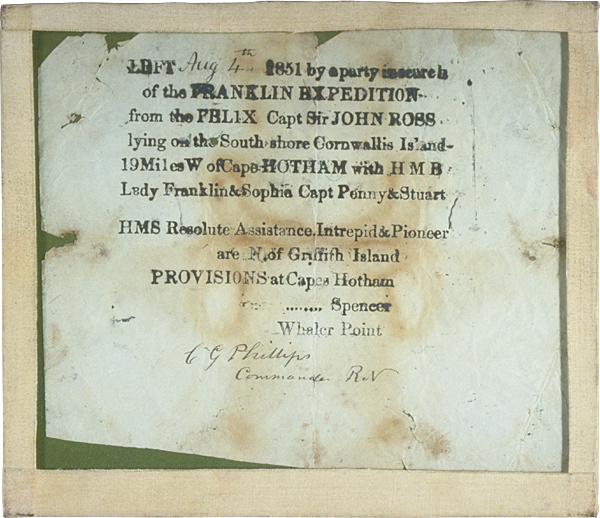 Finding one of those coloured and typed papers on board, among the remains present in the ships will help us, not only to know if the Franklin men survived as long as the year 1850 or even after, but also to know if the ships were actually remanned or not. If the wrecks of Terror and Erebus are searched for those metal cylinders, then we wonder. How many were taken aboard when the ship's embarked in 1845? Minus how many are found in the wrecks. Equals how many were used. Minus two...the one st Victory Point, and another used off Greenland. Then we will know how many are still out there, if any., that were used. That would be a good detectivesque work, however, that won't guarantee you that you would be able to find them but ay least you would know how many you should look for. Re that September 3,1851 message. Just suppose that the writer made a mistake, writing 112W in cold weather, when he intended to write 102W. Using 102W, 71N- the result is a spot between the east end of Victoria Island and KWI. The Polar ice moves, and Erebus could have drifted from its 1848 position. And further suppose that someone with a telescope from the Richard Collinson expedition saw the Erebus from afar but could not get to the ship due to ice conditions? It is known that Collinson reaches the east end of Victoria. Mmm, I don´t think so, that would mean the ship would have been northwest of Gateshead island, and then sent back south again to the place it was found. I don´t think any of the ships have reached ever 101 º latitude even if they had traveled south by the west of the Royal Geographical islands. And, for the sighting by Richard Collinson´s men, if any of the ships had been seen, we already would know that. Andrés, this is a fascinating arcticle! I must read it once more. Great work.